The Riviera Nayarit CVB has succeeded in placing the destination on high rotation for two months on Antena 1, Brazil’s most popular radio station. The Riviera Nayarit Convention and Visitors Bureau (CVB) teamed up with the Hard Rock Hotel Vallarta and Copa Airlines to generate strong exposure for the brand on Brazil’s Antena 1 radio station as part of the follow-up to their promotional visit to that country. The agreement stated that from October 20th through December 20th of this year the number one station in Brazil, Antena 1, would promote the destination to its listeners by giving away two trips to the Riviera Nayarit including airfare and five-nights’ accommodations for two. The agreement took place under the aegis of the executives of the Mexico Tourism Board (MTB) in Brazil, a federal entity that always heartily supports the activities of the Riviera Nayarit CVB in this South American country. Five daily spots are included in the agreement, airing in the cities of Sao Paulo, Campinas, Belo Horizonte, Porto Alegre and Sao José dos Campo, all touting the bounties of the Riviera Nayarit and the additional sponsors. 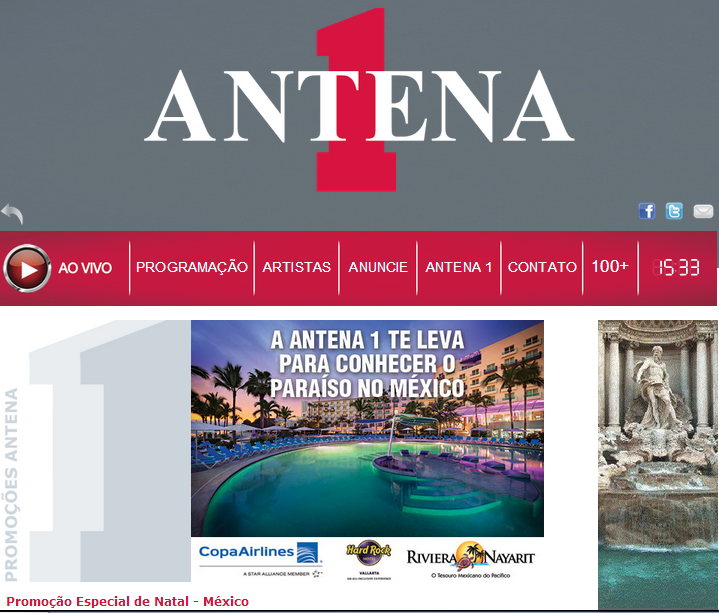 A banner was also placed on Antena 1’s official web page including the Riviera Nayarit’s URL with a promotional call to action, which will be up for the duration of the campaign. The same promotion is also posted on Facebook and on its printed material along with the logos of all the sponsors. In addition, there were three daily spots that aired from November 1-15 on Antena 1 with content exclusively from the Riviera Nayarit. Antena 1 boasts an average of 779,149 daily listeners, 64% of which fall into the A and B socioeconomic profiles; the majority of them are 25 years of age or older—95%, in fact. The radio personalities of this very popular station will choose the winners, who must take the time to inform themselves well about the three sponsors—the Riviera Nayarit, the Hard Rock Hotel and Copa Airlines—in order to win.